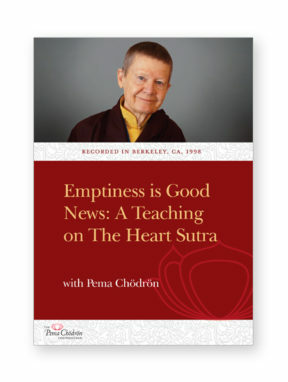 4 talks by Pema plus guided meditations by Tim Olmsted. Recorded at Omega Institute, Rhinebeck, NY, May 2010. These meditation teachings are largely based on the work of Yongey Mingyur Rinpoche as found in his book The Joy of Living. They include talks by Pema Chödrön introducing the basic principles of meditation and non-meditation as well as guided meditation sessions, questions and answers, and experiential exercises. Tim Olmsted assists with meditation instruction and answering questions from students. In this talk, we are instructed to bring our attention to simply experiencing our bodies, scanning them with a light touch of attention from top to bottom. Features guided instruction in working with negative emotions and positive emotions in the context of greater space, non-meditation. Recaps previous teachings of practicing with thoughts and body, and includes guided meditation using thoughts as the object of meditation in the space of open awareness. 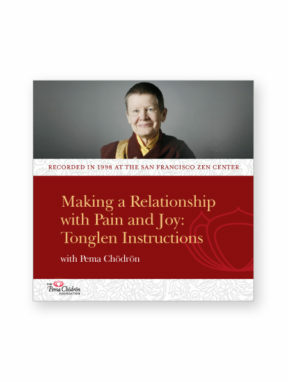 Pema Chödrön leads us in working with various sound experiences as objects of meditation.